The home to Irish rugby in Dublin reopened last summer in the form of Aviva Stadium. I don’t know if I can even label it as an reopening per se, because truly, the old Landsdowne Road Stadium was demolished before this new glassy structure was put on site as replacement. It is, in essence, a brand new stadium, with the seating capacity doubled in comparison to the old stadium. Pretty impressive. 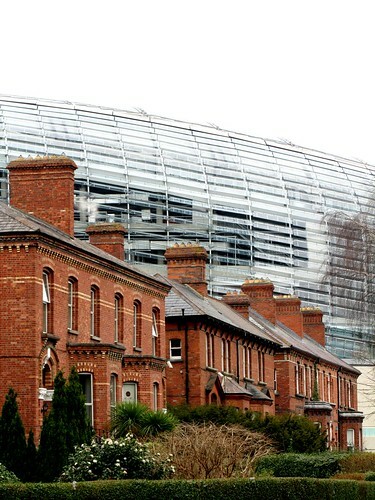 However, I am more charmed by the row of red brick houses along Landsdowne Road. Unlike many parts of south Dublin inner city, where Georgian architecture dominates the landscape, these houses are Victorian. The bricks used and stacked form much of the exterior styling and embellishment. No frivolous carvings, no fancy columns, no unessential portico. Perhaps I simply have a soft spot for red bricks – they look natural and timeless, no repainting required. yes they are. it’s the rustic and solid feel i think. interestingly i believe in boston one of the streets by where Fenway Park is (where the boston red sox play) is called Landsdown as well… not sure if it has an e at the end or not.